Tomorrow morning I am off to the very edge of the Great Frozen North, to the banks of the mighty St. Lawrence, there to celebrate Christmas. 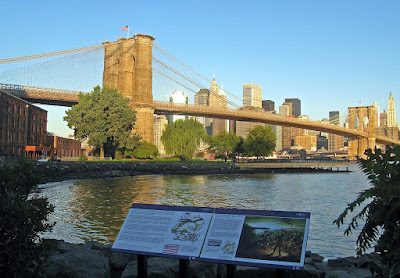 My opportunities for posting from that location may be few or none, so I leave you for now with warmest greetings of the season, and a scene of carolers gathered by the tree at the entrance to the Brooklyn Heights Promenade. A couple of days ago the Mets acquired off free agency arguably the best closer in the Majors, Francisco Rodriguez (I resist calling him "K-Rod" for the same reasons Lisa Swan gives in Subway Squawkers: (1) it's an obvious ripoff of the nickname of a certain Yankee; and (2) his first name is not "Krancisco"). This filled the need arising from the injury to Billy Wagner, but didn't address the greater problem of the unreliability of the Mets' middle relievers last season, especially Aaron Heilman. Yesterday they announced a three way deal with the Mariners and Indians that, among other things, sent Heilman to Seattle and former Mariners' closer J.J. Putz (yes, he'll need a thick skin in Noo Yawk) to the Mets. As Jesse Spector "putz" it in Touching Base, "this trade...gives the Mets quite possibly the most fearsome bullpen in the National League. (They had that this year, but now it's fearsome to opponents instead of their own fans.)" Whenever the Mets do a multi-player trade, there's always at least one that I regret their losing. In this deal, it's Endy Chávez. He's the kind of journeyman player that I admire because, despite his mediocre batting average that offsets above average fielding skills, I can't forget the occasional spectacular catch or clutch hit. I also like that he has a brother named Ender, who played for a season with my beloved Brooklyn Cyclones. What is it with Venezuelans--remember the Alfonso brothers, Edgardo and Edgar? 12/15 Update: MSNBC's First Read calls Illinois Governor Rod Blagojevich "F-Rod". 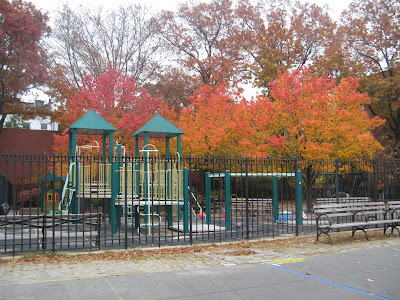 Fresh Air Fund needs your help this holiday season. This time of year is when we all get lots of appeals for money. This year is a particularly bad year for many. We have to decide who or what to support, and in what amount. 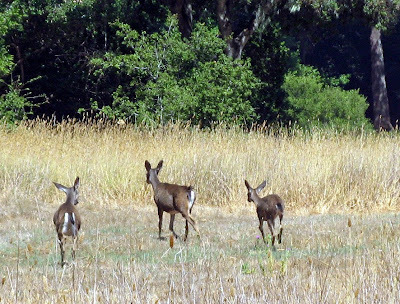 I'm making this appeal for you to consider the Fresh Air Fund, which gives inner city kids an opportunity, for a couple of weeks in the summer, to savor country life and have some experiences they couldn't otherwise enjoy. A donation now will help FAF establish next summer's program, is greatly needed, and will be deeply appreciated. Also, if you have a country or permanent house in a rural area in the Northeast, please consider hosting a child next summer. It's a way to go beyond the giving of money, and to experience firsthand the fruit of your generosity. Please visit FAF's website here. Chanukah on the Chisholm Trail. A tip o' the hat to Andy Bachenheimer. I was tempted to predict that the Tide would roll over Florida in the SEC championship game this weekend, but with fresh memory of my last prognostication failure, I was fortunate by being reticent. Now I feel the same temptation concerning the BCS championship game against Oklahoma, a team I've never much liked. But I had the same misgivings concerning the Gators in their championship matchup with Ohio State a couple of years ago, and was proved wrong. I used to have an uncanny sense of when Florida was going to go flat, but they seem to have lost their once unfailing ability to break their fans' hearts. Even their one loss this season, to Ole Miss, seems less embarassing now that the Rebels have cracked the top 25 in the BCS rankings. The Gators are number one and the Sooners second in the AP poll, while their positions are reversed in the USA Today coaches' poll. Does this mean that Bob Stoops is now more popular with fellow coaches, or Urban Meyer less so? Another sign of a long, cold winter? Perhaps it's just my imagination, but the local squirrels seem to be putting on weight above and beyond the norm this year. 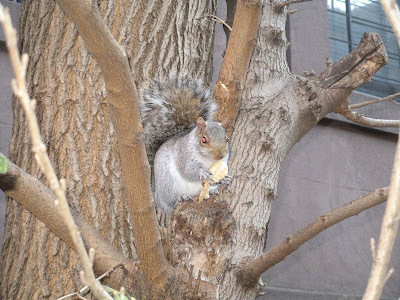 I spotted this one chomping on what appeared to be a bagel remnant scavenged from a trash can at the corner of Montague Terrace and Remsen Street, in Brooklyn Heights, yesterday morning. Take a look at the sky this evening. Shortly after sunset this evening, those of you afforded with clear skies (the forecast for the New York area is favorable) can see a conjunction of the moon, Jupiter and Venus in the western sky (see here). Viewers in Europe will be treated to an occultation of Venus, i.e. the moon will pass in front of the brightest planet. Why? The Gators are 10-1, second in the BCS ranking, and expected both to win the SEC and play Texas for the national championship. The 'Noles are 8-3, ranked 23rd in the AP poll, and could play in a BCS bowl provided they win the ACC championship. Trust me, this situation is custom-made for an upset. Look for State to take an early lead, then find ways to contain Harvin and disorient Tebow long enough to withstand a late Gator rally. Shame-faced 11/29 update: It looks like I've lost my touch. I used to be able to see clearly when a Gator upset was coming, and when it wasn't. For what it's worth, I'm glad I was wrong. Whether you're having traditional turkey, vegetarian or vegan alternative, or spaghetti carbonara, Calvin Trillin's favorite Thanksgiving dish, enjoy! Planxty: "Sally Brown" and "The Frost is All Over". Planxty was, along with the Bothy Band (see also here), one of my favorite traditional Irish groups. I never saw any version of the whole group perform live, though I did see Paul Brady and Andy Irvine, sort of a rump Planxty, at Town Hall in the early 1980s, and, since my date knew them, got to meet them backstage. In the late 80s I saw Andy performing solo at the Eagle Tavern, and, since my date (not the same one as at Town Hall) knew him, got to have a beer with him after. QE2 arrives at her final berth. Forty years to the day from the beginning of her maiden voyage, Cunard's magnificent Queen Elizabeth 2 (photo above from her penultimate visit to New York, last January) docked today at Dubai, United Arab Emirates. There she will remain as a floating luxury hotel. The story and photographs of her arrival are in today's Khaleej Times. 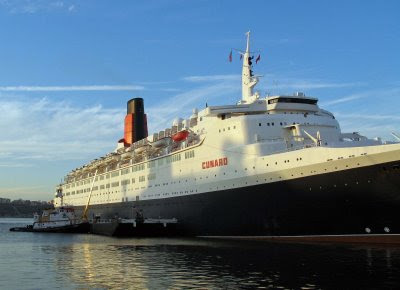 I'm sad to learn that her towering red and black funnel will be removed to make way for a "four-story penthouse"; but glad of that which will be preserved, including some of her best-loved interior spaces. Blog links: I'll take 'em where I can get 'em. 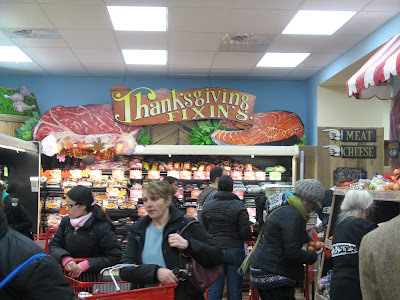 I'm thrilled to have gotten a blogroll link from Fucked in Park Slope, even though it's Heights, not Slope, strollers I have to dodge in my quotidian rounds. And, yeah, it wasn't so long ago I was pushing one, myself. A couple of months ago I posted with a link to a YouTube clip of the venerable Cajun vocalist and guitarist D.L. Menard doing his signature song, La Porte d'en Arrière ("The Back Door"). Unfortunately, that clip has now been removed from YouTube, so I've found another (see above) of D.L. doing the same song, accompanied by Marc Savoy on accordion, and by the exciting young group L'Angelus, consisting of four Rees siblings: Katie and Paige on guitar and bass, John on drums, and the youngest (20 as of this past June), Steve, playing very hot fiddle. Brooklyn gets a visitor from the Great Frozen North. Atlantic Superior, of Canada Steamship Lines, docked there. 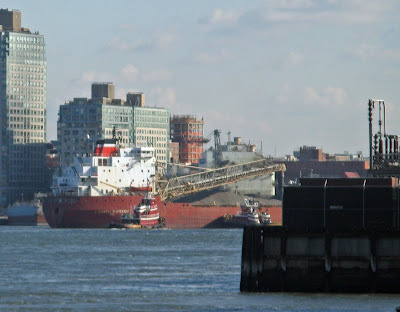 Atlantic Superior could be considered a new style laker; however, as her name proclaims, she's at home on open ocean as well as the Great Lakes. 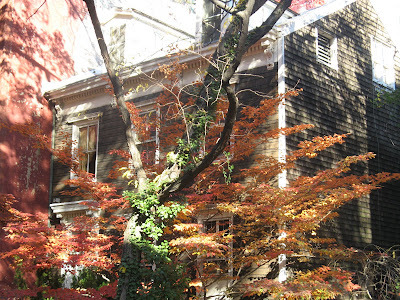 Tree in front of early 19th century house, Cranberry Street. 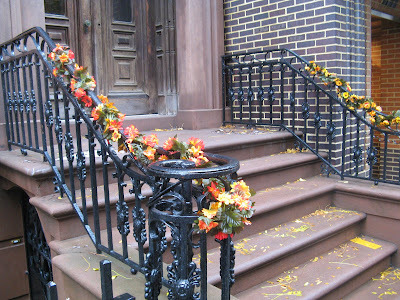 Decorated stoop railings, Columbia Heights. 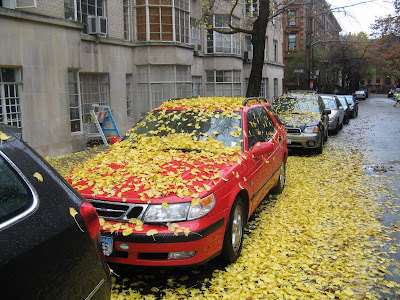 Leaves on car, Pierrepont Place. Your correspondent on the campaign trail. The result of this campaign was that Daniel defeated a thirty year incumbent, a personable but ineffective fellow who had been ousted as minority leader of the Senate several years before. Victory in the primary virtually assured Daniel of election to the Senate, as the district is heavily Democratic. Consequently, there was little to do for Daniel in the run-up to the general election. However, there was a bigger picture to consider. For many years, the Republicans have held the majority in the New York Senate. After recent elections, this majority had shrunk to a two vote margin. The Democrats controlled the Governorship and the Assembly (the lower legislative house), so a shift in power in the Senate would give one party a majority in both houses of the Legislature, as well as the Executive, for the first time in many years. Consequently, Daniel contacted people like me who had worked on his primary campaign and invited us to apply for positions as Squadron Fellows, to be sent to places where there were competitive races for Senate seats and where Democrats stood a good chance of taking seats previously held by the GOP, or where Democratic incumbents were in competitive races. 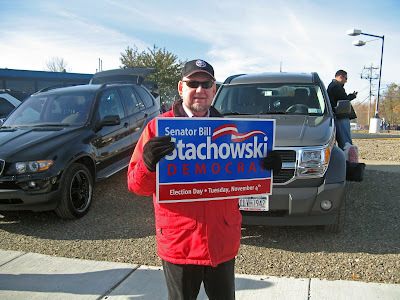 I was assigned to work on the campaign of incumbent Senator William Stachowski, whose district includes the southern portion of the City of Buffalo and several suburban communities to the south of the City. Stachowski, a 27 year Senate veteran who stood to chair the Finance Committee should the Democrats get control, was facing a strong challenge from Dennis Delano, a former police detective with no political experience who, despite refusing to debate or give press conferences, was polling ahead of Stachowski going into the final stretch. Saturday, November 1 (E-Day minus three). There were four of us assigned to work on campaigns in the Buffalo area. My companion on the Stachowski campaign was Frances, a St. Louis native and Lower East Side resident, as well as a playwright and novelist. Joining us in the rental car heading west on Saturday, November 1 were Matt, a Vassar alumnus with a degree in classics and considering law school, and Seth, a Chicago native with a freshly minted Columbia baccalaureate in urban studies. Matt and Seth were assigned to the campaign of Joe Mesi, a former heavyweight boxer who was contending for a seat held by a Republican who was retiring. We arrived at our hotel on Niagara Falls Boulevard in the Town of Amherst early in the afternoon, and contacted our respective campaign headquarters. Mesi's HQ was practically next door to the hotel, but Stachowski's was some miles south, so his volunteer coordinator had to come get Frances and me. Shortly after we arrived at the HQ, we were given a packet of literature, a list of addresses and a map of a neighborhood in Cheektowaga ("Land of the Flowering Crabapple Trees"), as well as keys to a rental car, and were directed to go knock on doors. We spent several hours canvassing a tidy suburban area of small brick or cinder block houses. The people who came to their doors were by and large cordial, though some complained of the volume of literature they'd received in the mail. After finishing our canvass, we returned to campaign HQ and dropped off the results, then were driven back to our hotel. Sunday, November 2 (E-Day minus two). Shortly before the game, we were taken to the local UAW headquarters, where we were fed chicken wings (natch) and pizza while, along with many other campaign workers, we watched the game on a big screen TV. Frances and I resisted the temptation to cheer for the Jets, who won the game. While we were there, the Senator came in, and one of his workers took our picture with him. I did my best deer-in-the-headlights impression. After the game, Frances and I were to be sent out to do more door-knocking, but I felt like the bug I thought I had shaken off a day before our departure was trying to reassert itself, so I begged off and went to do phone canvassing at Mesi's HQ instead. Monday, November 3 (E-Day minus one). Monday we did more door-to-door canvassing, and had several interesting conversations, including one with a woman in her 90s who had been deported with her family from her native Poland at the end of World War II, and survived imprisonment in a Gulag camp in Siberia. She was very emphatic about what the right to vote meant to her. Back at the HQ, troops of volunteers and some paid canvassers would periodically arrive to get their assignments. 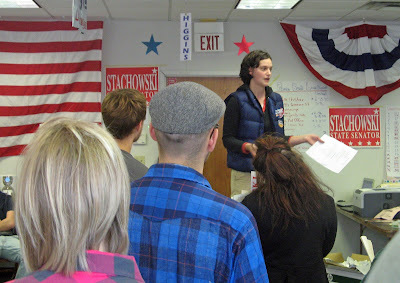 Here is campaign worker Sarah rallying the troops before sending them out. 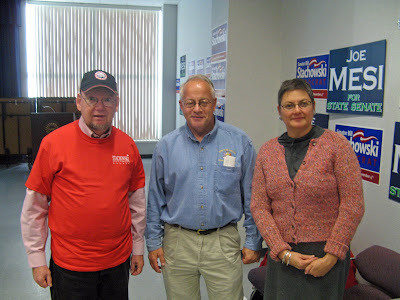 Tuesday morning, election day, saw us up well before dawn, as we were to open polls at 6:00 A.M. Arriving at HQ, we got the glad news that Obama carried Dixville Notch, New Hampshire, by a margin of something like 15-6. Frances and I were sent to a school in Lackawanna, where we checked the machines and made sure everything was ready for the voters, then stood outside to give "palm cards" (lists of candidates, including Senator Stachowski, on the Democratic line for various offices in that district) to voters as they approached the polling place. It proved to be a beautiful fall morning, with temperatures already in the low 60s. 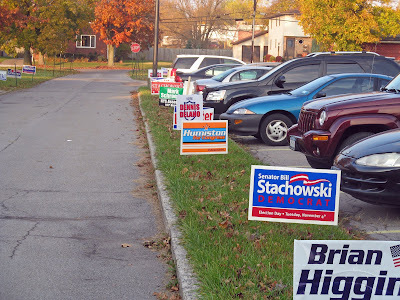 Despite the many candidates for various offices (see signs in photo below), we were the only campaign workers at this polling place. 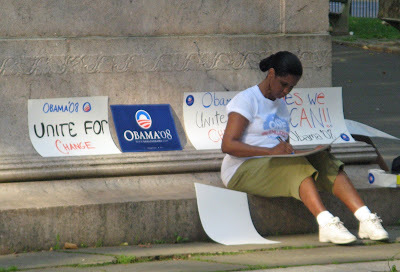 If you're wondering why no Obama signs, it's because there was little Obama campaign activity in New York (and virtually no McCain activity, though a woman drove into the lot in a Jaguar with a McCain-Palin bumper sticker) as New York State was considered a shoo-in for Obama. After the morning rush of voters, we returned to HQ, where we were redeployed to a firehouse in West Seneca to catch the noontime crowd. Here there were workers from other campaigns handing out literature to voters as they approached the polls, including one from Stachowski's opponent, Delano. However, everyone was very cordial. Frances got into a friendly conversation with the sister of a man who was running as an independent (although he also had, but downplayed, the Republican nomination) for the U.S. Congressional seat held by the popular Democrat Brian Higgins, whose campaign HQ we shared. Earlier, when I had been handing out palm cards in Lackawanna that listed Higgins along with Stachowski and the Assembly candidate in that district, Mark Schroeder, several people asked me, "Who's running against Higgins?" I could only shrug. We broke for a late lunch and to see what was going on at HQ before going out on our final assignments. We heard one report of a worker being harassed at a poll site; a local lawyer who was volunteering his services to the campaign was dispatched to the scene. He returned soon to report that the matter had been resolved. Later, Frances and I were assigned to go to different polling places to hand out palm cards to latecomers (the polls closed at 9:00 P.M.), and to get the final numbers from the voting machines after the polls closed. I went back to the school in Lackawanna. Standing in the parking lot--there were few voters after 8:30--I kept checking my BlackBerry for early returns in the Presidential race. I was sorry to see Kentucky called for McCain early. I expected him to win there, but hoped it would at least be close, and that the Democrats might have a shot at unseating Republican Senator Mitch McConnell. Vermont, God bless it, was the first state called for Obama. After the polls closed, I went inside to get the vote counts for the State Senate race. This was a bit complicated, as there were something like nine or ten party lines on the ballot, and Stachowski was on several of them: Democrat, of course, and Working Families; but also, as I recall, he had the Conservative line. Delano had the Republican and at least one other line; then, there were a few minor parties that had their own candidates. So, I had to listen carefully and write quickly as the poll workers read the numbers from the backs of the machines. I was gratified to see that Stachowski had done well in the three election districts that voted at the school. As soon as I had the numbers written down and double-checked against the counters on the machines, Frances arrived to give me a ride back to HQ. We delivered our numbers, then tucked into a buffet of pasta, meatballs, Italian sausage, and salad (Frances, a vegetarian, limited herself to pasta and salad), provided by the campaign. After inhaling my dinner, I joined others clustered around a computer showing results coming in for the Senate race. Stachowski held an early lead of about 52-48. I kept checking my BlackBerry for presidential results, and was thrilled to see Pennsylvania called for Obama early. With Stachowski's lead holding steady, the computer was switched to CNN in time to catch Ohio called for Obama. At this point, I knew it was in the bag. At about 10:00, Matt and Seth showed up to take Frances and me back to the hotel. They asked if we minded going to the Mesi party for one drink, and we agreed. Things were not going well for Mesi, but they wanted a chance to say goodbye to some people they had worked with. We arrived at the party, at a bar and restaurant in Tonawanda, at about 10:30. While we had our beers, the election results on the TV above the bar showed Mesi falling further behind his Republican rival, while Stachowski's four point lead held steady. More and more states were being called for Obama. We got back to the hotel in time to see McCain's gracious concession speech in our rooms, after which we gathered in the lobby and toasted Obama's and Stachowski's victories with a bottle of prosecco Frances had bought at a liquor store near Stachowski's HQ. Then we retired to our rooms to watch Obama's victory speech. Epilogue: the Falls; a gratifying result. Since some of my traveling companions had never seen Niagara Falls, the next morning we rose early, checked out, and drove there, arriving just after daybreak. The parking lots near the Visitor Center weren't open yet, so we parked a block from the Park entrance and walked to the eastern edge of the American Falls. Then we walked across the bridge to Goat Island and traversed it to the lip of the more spectacular Horseshoe Falls, which extend to the Canadian side. 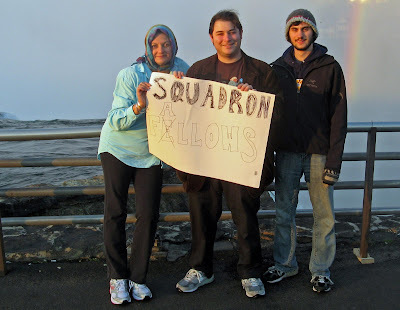 Here are Frances, Matt, and Seth holding our hurriedly made "Squadron FAllows" sign, with a Niagara rainbow in the background. We learned that morning that the labors of the Squadron Fellows had not been in vain: thanks to victories in Suffolk County (eastern Long Island) and Queens, as well as Stachowski's successful defense of his seat, the Democrats had gained control of the New York Senate. We were proud to have played a part, however small, in this historic transition. Consider also the column of items under "narrow your search" on the right of the page: "About Stupid; Glow Stick; Key Chain; Stress Ball; Gift; Dupont Lighter; Fridge Magnet; Suction Cup; Lighted Ice Cube; Judaica." Judaica? Has al Qaeda hacked Verizon's search engine? For fellow lovers of wordplay. "Wasilla's all I saw" is a PALINdrome. End of the line for the Rays? Unfortunately, yes. I've just started watching this bobtail game in the bottom of the eighth, with two out and one on via a walk. Price, my favorite go-to guy, is on the mound. Utley steals second, but Price gets Howard swinging. The Rays have three outs to go. My fingernails are about to become fodder. Longoria pops out. Down to two. Navarro singles! We live for now. Perez, pinch running, steals second, but Zobrist lines out to right. Eric Hinske is our last hope. Hinske strikes out. Phils win. No more having to watch those damned towels. Lidge, the Philly closer, is awesome. MANNY RAMIREZ AND THE METS: Who else can and will give the dollars and years Manny’s agent, Scott Boras, wants for the 37-year-old? How about a team that needs another star to distract from the memory of a second consecutive collapse. A team that is in dire need of a right-handed power bat for a corner outfield spot. A team that showed an interest in acquiring Ramirez a few years ago. A team that has built a reputation as the best landing spot for Latin players. A team that plays in Ramirez’s hometown. And a team that has built a reputation for landing the superstar player. No! No! No! Does anyone in Mets' management remember Roberto Alomar? Eddie Murray? Bobby Bonilla? Kevin McReynolds? (Surely you remember Mo Vaughn--you're still paying him.) Spare us. Has Nirvana changed our language? Stevens' guilty verdict not only all but ended the career of the Senate's longest-serving Republican; it also signaled the end of an era for Senate Republicans. Think about it -- next year, we could see a Senate where there is no Trent Lott (already retired), Pete Domenici (retiring), John Warner (retiring), Stevens (who will most likely lose next week), and possibly Mitch McConnell (who's in the fight of his political life down in Kentucky). And nevermind the possibility that the GOP Senate caucus won't have a Dole, either. Update: The good people of Alaska re-elect Stevens. Should "nevermind" be their new state motto? No, I haven't gone walkabout or joined a contemplative monastic order. I've been busy with other stuff. I'll be back soon. 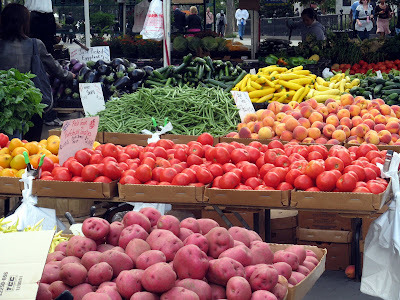 Brooklyn Heights Greenmarket, October 2, 2008. The Rays win the pennant! The Rays win the pennant! The Rays win the pennant! Price, the kid from Vandy, comes through with the crucial outs. One of the best league championship series for a while. Sorry, Twiffer, and dearest wife. The Amygdaloids: neuroscience and rock 'n' roll. The other members of the group are Nina Galbraith Curley (bass and vocals; PhD candidate in neural science at NYU), Daniela Schiller (drums and vocals; postdoctoral fellow in neural science at NYU), and Tyler Volk (guitar and vocals, with lead vocal on "Memory Pill"; associate professor of biology and science director of the NYU environmental studies program). Yom Kippur ended at sundown yesterday. I'm not Jewish, but I like the idea of a "day of atonement" in which, among other things, you're supposed to make amends to anyone you've wronged in the previous twelve or thirteen (such are the vagaries of the Jewish calendar) months. So I'm trying some atonement here for things I've posted on this blog. First, Ben Stein. I really came down hard on you. It's largely because I was so disposed to like you. I enjoyed your show, Win Ben Stein's Money. More to the point, we had a friend in common; someone whose judgment I respected and who once did one of the nicest things anyone has ever done for me. To see you trashing evolution came, to say the least, as an unexpected blow below the belt. Your falling for the canard that Darwin's theory gives support to Nazi racism and the Holocaust had me shaking my head in despair. Nevertheless, I'm willing to allow that, in this matter, you were acting the fool not the knave. Next, Leon Kass. I made sport of your fuddy-duddy-uncle-ish objections to outdoor eating in general, and ice cream cones in particular. I disagree with you about embryonic stem cell research (I've never cottoned to slippery-slope arguments, so long as reasonable people like me get to decide where the lines get drawn) and some other issues for similar reasons. Nevertheless, I'll confess, I find you fascinating, because you seem to have something I don't (which, my having lived over sixty two years, may be evidence of naivete or even imbecility): what Miguel de Unamuno called the "tragic sense of life". It's something you seem to share with the British philosopher John Gray and my former Fray colleague and fellow blogger IOZ, not that either of them would necessarily want to be put in the same category with you, or with each other, or with Unamuno, for that matter. Last (and certainly least), Sarah Palin. I was a bit snarky, but I'll give you credit for a couple of things you said during your Katie Couric interview: "Well, I am all for contraception", and "Oh, I think it [evolution] should be taught as an accepted principle." Good for you, though you still don't get my vote. I was going to post something about it, my friends, but I just can't top what's on my favorite sports blog. Yes, that one. Addendum: Looking at the reader comments on MSNBC's "First Read" (for example, those on this post by Domenico Montanaro), I'm finding them running at least 20-1 pro-Obama. Also, the few pro-McCain comments tend to be poorly written, lacking in coherent argument, or just plain loony (e.g. OBAMA IS THE ANTI-CHRIST! STOP HIM!!!!). I find it hard to believe that MSNBC's readership is, on the whole, that heavily weighted with Democrats or "liberals" (OK, it ain't Fox, but nevertheless...). What this does make me think is that the McCain-Palin campaign has simply flummoxed intelligent conservatives (not a null set), so, like Cubs and Mets fans, they've had to resign themselves to pondering future prospects. It's good to know that Christina Long of The Brooklyn Paper shares my "B" alliteration fetish. Rays, Red Sox to ALCS. There will be tension in your correspondent's household starting next Friday evening, when the Rays host the Red Sox at Tropicana Field for the opening game of the American League (yes, for now, I'll call them by their real name, not the Short-Attention-Span League) Championship Series. My wife, Bay State born and bred, and schooled but a few blocks from Fenway, will have to bear this old Tampa hand's cheering for the Rays in their maiden trip to the post-season; indeed, capping their first-ever winning season. Shades, dare I say, of the '69 Mets? And, whoever wins the ALCS, I will root for in the World Series. 10/9 update: Tim Marchman, who was one of my reasons for mourning the loss of the New York Sun, has a piece in Slate that makes me feel even better about backing the Rays. 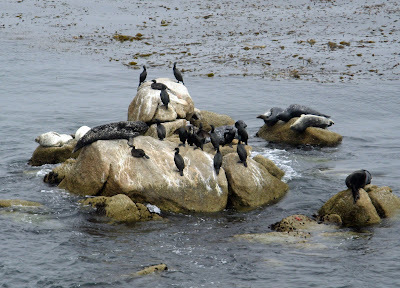 Seals, sea lions, and cormorants; Monterey Bay. 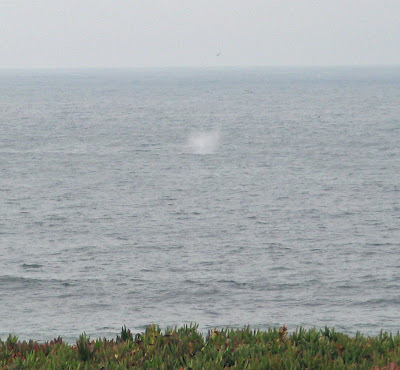 Whale (humpback?) 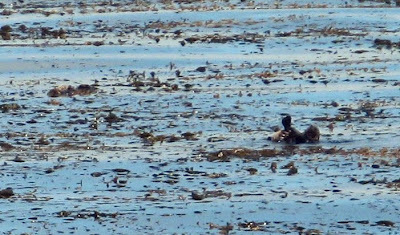 breaking surface, Fort Funston. South Florida falls to Pitt. Just as I wrote last week that I feared, my South Florida Bulls were eviscerated by the Pittsburgh Panthers. The Bulls, as I've written before, have enough Gator DNA that there always comes a time, fairly early in the season, when they succumb to cockiness and get blindsided by a team they're supposed to beat. Kaddish for the New York Sun. As someone born on the leading edge of the baby boom, I've found myself having to say farewell to many of the people I admired in my childhood, youth, and even younger adulthood, of late. This year, to give several examples, I've mourned the passing of Bo Diddley, Erik Darling, John Stewart, Paul Newman, and my friend Cicely Nichols. Today, though, I'm grieving for a newspaper. The New York Sun existed for just over six years, and I've been a subscriber only for the last year and a half. The Sun was intended to fill a niche in New York journalism that has remained empty since the demise of the World Journal Tribune, that of an upscale, broadsheet "conservative" paper. I put "conservative" in quotation marks because, as I've written here before, in the footnote (below the addenda) to this post, it is a term that no longer has a clear meaning (as is also true of "liberal"). Indeed, the conservatism of the Sun was of a different cloth than that of the old WJT. Moreover, unlike the WJT and the Times, it made no pretense that its news articles were "objective", as opposed to its editorial and opinion columns. "Fair and balanced" it was not, nor did it aspire to be. I disagreed, sometimes vehemently, with much of what I read in the Sun. Nevertheless, I was always happy to see it at my doorstep. (Was it just my imagination that the delivery person usually put it down to the right of my copy of the Times?) I liked to read it because it challenged my thinking on some issues, and inspired me to hone my arguments. I'll always be grateful to Amity Shlaes for adding Pigovian tax to my vocabulary, and in John McWhorter I found someone I could agree with more often than not, and who brought to issues like the "war on drugs" perspectives that were new to me. I'll also miss the trenchant baseball analysis of Tim Marchman, and coverage of the arts that was, in my view, second to none. Among the last, I was especially fond of the essays on art and architectural history by fellow Brooklynite Francis Morrone. I hope all of these writers quickly find other venues for their work, and thank Seth Lipsky and his team for a fine run. Memo to Jeff W., cc Omar M.: keep Jerry. 10/4 update: Jerry gets a two year contract. Things are looking very bad for the Mets. The bullpen has just give up back-to-back homers, putting the Marlins ahead 4-2 in the eighth. Meanwhile, the Brewers have just gone ahead of the Cubs 3-1, also in the eighth. There were four possible outcomes today: Mets win, Brewers lose, so Mets win wild card; Mets and Brewers both win, in which case they have a one-game playoff; Mets and Brewers both lose, ditto; Mets lose, Brewers win, so brewers get wild card and Mets are done. Three possibilities out of four have the Mets staying alive. Right now, the one possibility that kills them looks almost certain. Update: Brewers win their game; Delgado just flied out with two on, two out, to end the eighth. Second update: It's still 4-2, going to the bottom of the ninth. Wright is up, then Chavez, then Easley. Third update: It's down to Easley. Fourth update: Easley walks! It's up to Church. Final update: Church flies out. College football: it's crazy upset weekend. Number one, USC, falling to unranked Oregon State 27-21 on Thursday night, as previously reported here. Number three, Georgia, losing to number eight, Alabama, 41-30. Number four, Florida, embarassed by unranked Ole Miss, 31-30. I kind of expected this after the Gators' romp over Tennessee last week. This seems to be the time every season at which their heads swell so much they can barely fit in their helmets. Number nine, Wisconsin, edged by unranked Michigan, 27-25. Number sixteen, Wake Forest, upended by unranked Navy, 24-16. Deacons coach Jim Grobe had the following enlightening observation about his team's loss: "I think the ability to not throw the football without turning the ball over was what hurt us today." Number twenty, Clemson, bested by unranked Maryland, 20-17. The Terps established themselves as giant killers a couple of weeks ago by upsetting California. Number 24, East Carolina, trounced by unranked Houston, 41-24. Pirates sunk twice in a row, so goodbye to top 25 and a Cinderella season. Non-upset of the day: my South Florida Bulls crushed North Carolina State, 41-10. Perpetual fusspot that I am, I worry about Pitt next week. 9/29 update: AP and USA Today polls both have South Florida ranked tenth. All the more reason to worry about Pitt next Saturday. Then, again, they got all the way to number two last year before losing to Rutgers. Speaking of the Big East, Connecticut has just cracked the top 25, on the strength of victories over Hofstra, Temple, Virginia, Baylor, and Louisville. Have I managed to get this far into the season without mentioning the Nittany Lions? They're 5-0 and ranked sixth. Hope I didn't curse them by mentioning this. MLB playoff picture shapes up. In the Real Baseball League (a.k.a. the Senior Circuit), the Cubs (who haven't won a Series since 1908) and the Dodgers are in. The other two will come from these three: Mets, Phillies, Brewers. Until recently, the Brew-ha-has (as Milwaukee native and Kettle of Fish owner Patrick calls them) looked like a lock for the wild card, but they've had a near end of season collapse that rivals the one that doomed my Mets last year. Meanwhile, the Mets, despite serious injury hits to their starting rotation, bullpen, and outfield, are still in the thick of things. If they can make the post-season and last beyond round one, Manuel should not only be stripped of his "interim" designation; he should be NL manager of the year. The Designated Hitter League (a.k.a. the league for people with short attention spans) playoffs definitely include Los Angeles de Anaheim and the Tampa Bay Rays. Conventional wisdom has it that the Rays, having no playoff experience, have no hope of going the distance (just like the 1997 Marlins and the 1969 Mets). The Red Sox look to be a lock, either as Eastern Division champs if they can overtake the Rays and relegate them to the wild card, or, more likely, as the wild card. (My wife is happy.) The final spot will be taken by the Central division champs, either the White Sox (opening the possibility of a first-ever "El Series") or the Twins. I see four possible final outcomes that would make me happy, in order of preference: (1) Mets (but, given the conventional wisdom that pitching is everything in the playoffs, they seem a long shot); (2) Rays (old hometown loyalty, as well as a liking for Cinderellas, and I think Joe Maddon is a really cool guy); (3) Cubs (for reasons explained here); and (4) Red Sox (spousal loyalty). Here's the Canadian blues singer (part of a proud tradition going back at least forty years, to Ian Tyson doing "Flies in the Bottle") Sue Foley doing "Queen Bee", her version of Slim Harpo's "King Bee", which was also covered by Pink Floyd and the Stones. Thanks to shadowknowz for the clip. Thanks to Kei Andersen, I've discovered Pandora Radio, a site that lets you set up your own music programs to play on your computer, based on your preferences for certain artists or styles. So far, I have set up "stations" that play music by (or similar to that by) Gram Parsons, Fairport Convention, Miles Davis, Koko Taylor, and Kronos Quartet. It's easy to do, and it's free. College football: Bulls, Pirates survive; Trojans romp, not much else of note happens. Contrary to my earlier trepidations (see "Update"), my South Florida Bulls were able to knock off the Kansas Jayhawks (since USF beat the Tennessee-Martin Skyhawks in their opener, the season record is now ungulates-2, raptors-0), as a result of which the Bulls rose to twelfth in the AP poll (one better than the rank previously held by Kansas), while the Jayhawks fell to nineteenth, the former position of USF. The Bulls are now cruisin' for a bruisin', but I'll be bold and say it probably won't come next week at the hands of Florida International, even though the game's in Miami. It'll be closer than expected, though. This year's big surprise team, the East Carolina Pirates, despite having major upsets over Virginia Tech and West Virginia, was nearly capsized by Tulane's Green Wave, but managed to right itself. The Georgia Bulldogs, ranked second going into the game, survived a tough challenge from Steve Spurrier's unranked South Carolina Gamecocks. The Bulldogs were thereby demoted to third, behind USC and Oklahoma. The Florida Gators, idle this week, held at number four. Southern Cal obliterated Ohio State, leading the New York Times' Pete Thamel to declare them this season's presumptive champion. However, NBC pundit Joey Johnston thinks an SEC team could unhorse the Trojans. Not so fast, says Johnston's NBC colleague John Walters, the Big 12 is really tops this year. So, there's reason to keep watching. 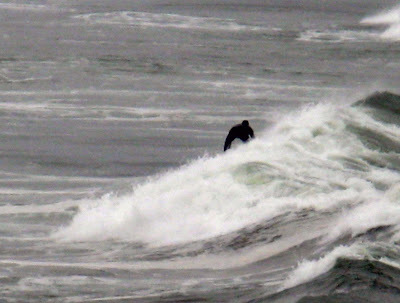 Surfer, near Cliff House, San Francisco. 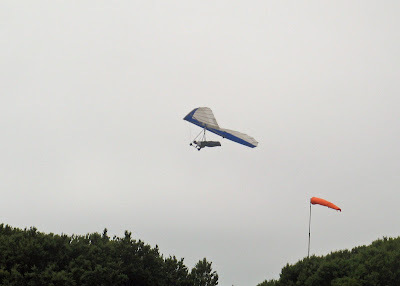 Hang glider at Fort Funston. 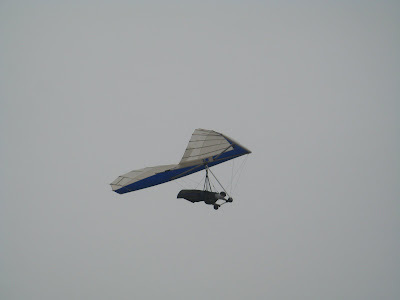 Closer view of hang glider. 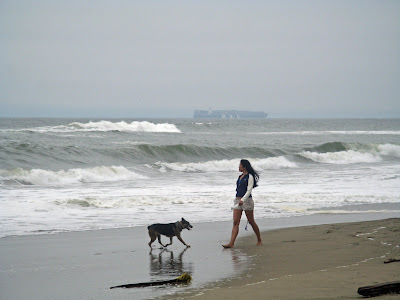 On the beach, Fort Funston. 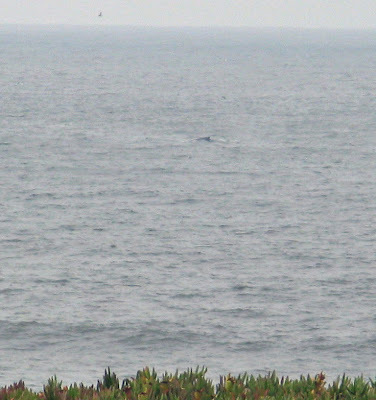 Another Fort Funston beach scene. 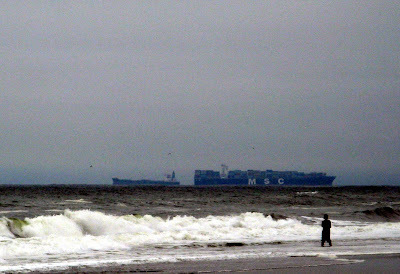 Note the container ship (inbound, decks stacked with containers, probably loaded with Asian-made goods) and tanker (outbound, in ballast, probably headed to Alaska to load crude for East Bay refineries) passing in the background. 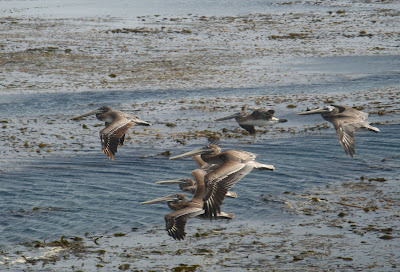 On a visit to the Point Reyes National Seashore, we began by walking the Earthquake Trail. 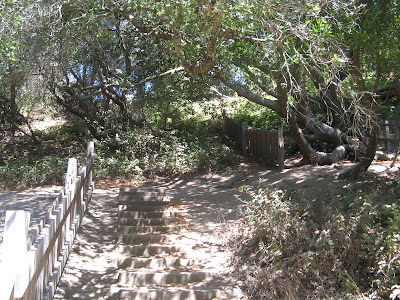 The displacement between the sections of fence in the photo above (lower to the left, upper to the right) shows the extent to which the land was shifted by the great 1906 earthquake that devastated San Francisco. 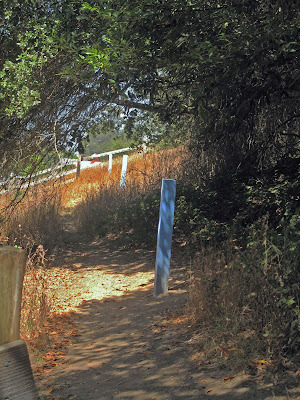 The three posts marking a line going toward the fence in the background show the approximate alignment of the San Andreas Fault. The Fault roughly marks the boundary between the North American and Pacific tectonic plates. So, I can say that, when I took this photo, I was standing on the Pacific Plate, to the west of the Fault, looking at the North American Plate, to the east (and right) of the line extending through the posts. Fortunately for me, the earth did not move during my visit to this very excitable spot. I'm told that Northern California experienced a small earthquake a few days after we left.